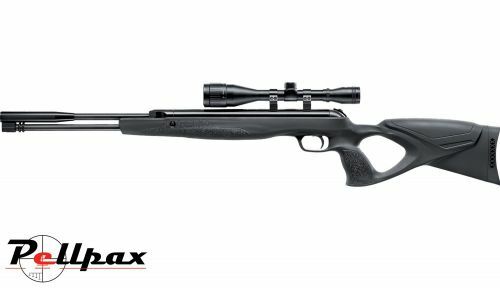 The Walther LGU is a high powered and remarkably accurate spring powered air rifle that benefits from some of the finest airgun technology today which makes the firing cycle very smooth and quiet. Being made by Walther the Barrel is a world class unit so you have the confidence that the accuracy will never be compromised. The main feature of the internals of this rifle is the rotating piston which runs on synthetic bearing material, which dramatically reduces vibration when fired to minimise recoil and noise produced. This makes it one of the quietest and sweetest shooting rifles straight of the box today. The stock of this rifle is vastly different from that of the standard model and incorporates a thumbhole grip which is very ergonomic, and is also completely ambidextrous. Checkering is also included on the forestock and pistol grip in the modern Walther style as can be found on the Terrus today which maximises grip and provides a distinctive appearance.